The exhaustingly titled Ghost in the Shell: Stand Alone Complex Solid State Society is the third film in the respected Ghost in the Shell series, which was initiated by Mamoru Oshii's original 1995 Ghost in the Shell and its 2004 sequel, Ghost in the Shell 2: Innocence. The TV series spin-off Ghost in the Shell: Stand Alone Complex kicked off in 2002, two years before Oshii's own sequel hit Japanese cinemas. Solid State Society is the latest episode in the franchise, a theatrical feature that plays largely like an extended episode of the TV series, whose narrative threads it incorporates and whose characters, structure and style it retains. For fans of Stand Alone Complex, and there are many, this is all good news, as the larger budget and longer running time allow for a more detailed and uninterrupted story and slicker visuals and animation than the series allowed. For those of us looking for a film that recaptures the beauty and complexity of Innocence there is less to celebrate. The original Ghost in the Shell was a genuinely innovative and exciting anime feature, something that is harder to retrospectively appreciate due to the number of films and series that it has directly influenced (the recent anime series Ergo Proxy is just one of many). Its sequel, Innocence, was a challengingly complex work of astonishing visual and aural beauty, one that expanded concepts explored in the first film into the realms of the metaphysical. The cult that built up around both films was not cast iron – each divided opinion even within the anime fandom and continue to do so, something visionary director Oshii Mamoru has doubtless become familiar with (his 1991 live action film Avalon proved similarly divisive). 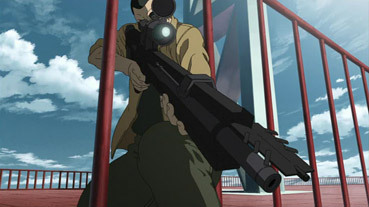 Stand Alone Complex took the situations and characters of Ghost in the Shell and from them fashioned a futuristic cop show built around the investigations of Section 9, the elite security force at the centre of both films, and particularly the cybernetically enhanced characters of Major Motoko Kusanagi and her long-standing friend Batou. The technology and many of the themes of the series are borrowed from the first feature and have become well worn with the passing of time. The key strength of Stand Alone Complex is its sociopolitical subtext, its speculation of possible future directions for issues of present concern. Although built around a self-contained story, Solid State Society does assume some knowledge of the characters and background from Stand Alone Complex. It's been two years since Major Motoko left Section 9, which has now substantially expanded and has Togusa as it's head man. The unit's latest investigation centres around the mass abduction of children and a string of mysterious suicides by members of the disbanded Siak Republic. Former Siak Colonel Ka Gae-Ru is one of them, taking a hostage and then shooting himself, seemingly terrified by someone he calls The Puppeteer. 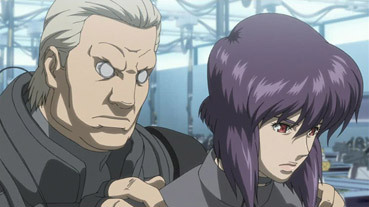 Pursuing a lead, Batou is unexpectedly re-united with Motoko, who warns him to stay away from something called The Solid State Society. Batou keeps their meeting a secret from his colleagues, but can't shake the suspicion that Motoko may actually be the Puppeteer. The budget increase on Solid State Society over its TV counterpart is signalled by the early swooping shot of Motoko, perched Batman-like high above the city and contemplating her next move. We're still a long way short of the visual heights climbed by Innocence here, but given that Oshii had a budget of something like seven times what director Kamiyama Kenji had to work with, this is not completely surprising. The expected mix of cell animation with GC work is present, but Oshii's striking placement 2D characters within detailed 3D CG environments is rejected in favour of closer integration of the two, with the fast moving Nissan cars coming across as the favourite job of the 3D animators. Solid State Society tells a well devised and reasonably complex story at a breezy pace, and as an addition to the Stand Alone Complex world it delivers in the manner of some of the better multi-episode threads of the series. But as a Ghost in the Shell movie it's walking in some pretty large footprints. Both the original film and its sequel were visionary works that genuinely broke new ground, something Solid State Society simply does not do. There's little here that series fans won't have seen before, the concept of a master hacker hooking into the cyberbrains of citizens harking back to the first film – the hackers even have almost identical names – while the later conspiratorial revelations will likely prove old news for genre diehards. There's plenty of action, but anime gunfights are never going to rival those of top-flight live action films, and the undeniably cool technology has not really advanced much from the series' early days. The film still has its memorable moments, the neatest occurring at the climax of a sequence in which Batou and Saito chase down a sniper, and the bullets of two opposing gunmen who have fired simultaneously at each other almost collide in mid flight. There are also a couple of nice surprises within the confines of the expected – from the moment Batou and Motoko meet you just know she'll be back on the team eventually despite Batou's suspicions, but her reappearance is nonetheless perfectly timed. 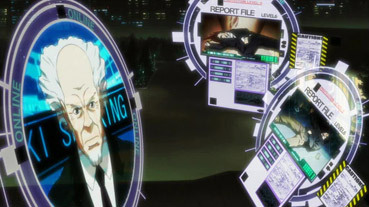 As with the series, it's the sociopolitical elements that give the story it's substance, with current Japanese concerns over a declining birth rate and an ageing population effectively incorporated, although the repeated suggestion that the issue of increasing privacy invasion through the use of surveillance cameras will be explored remains teasingly undeveloped. But for every aspect of the film I enjoyed there was another that irritated. Stand Alone Complex fans will probably delight at the juke-box variety of Kanno Yôko's music score, but I found the multi-genre rock and pop cornucopia annoyingly distracting rather than complimentary to the visuals, and there's not even a hint of the operatic majesty that so distinguished Kawai Kenji's score for Innocence. And at the risk of inflaming the passions of the devoted, I groaned out loud at the resurrection of the Tachikomas, robotic assistants with the voices of over-excited children whom I always regarded as the Jar-Jar Binks of the Stand Alone Complex world. At least they're not on screen for long. In the end Solid State Society delivered what I was expecting, no more, no less. If you're a fan of the Stand Alone Complex series then you'll probably be well happy with this latest chapter, which despite its graphical enhancements is essentially more of the same, its story comprised of familiar elements but still well enough told. But if Oshii is your man and you're hoping for something as innovative as Ghost in the Shell or as daring as Innocence then you're in for a bit of a let-down. Despite its feature status, Solid State Society is an extension of the TV series, which for this viewer never successfully captured the complexity and vision of Oshii's films and whose character interplay always felt closer to standard TV drama or even soap opera than the more complex and troubled relationships suggested by its big screen cousins. There's nothing wrong with Solid State Society, a professional and entertaining enough job. What's missing, something its big screen predecessors had in spades, is the magic. The anamorphically enhanced 1.78:1 transfer here is clean and sharp, with very good colour reproduction. The slight movement judders caused more by the animation style than any conversion issues. Colours are distinct and there is no evidence of digital blocking or banding on areas of single or similar colour. There are a total of six soundtracks on offer, with both the original Japanese and the English dub each available in Dolby 2.0 stereo, Dolby 5.1 surround and DTS 5.1 surround. It's the usual story of surround track superiority, with the DTS in particular having some serious wallop, announcing its credentials from the opening shot and making good use of the surrounds for background and specific sound effects. It's all down to personal preference, of course, but I've never cared for the voice work on the American dub of the series – Batou in particular lacks the gravitas of the Japanese original, and hard though it is to believe, the Tachikomas are even more annoying as hyper-excitable American children. Unlike Manga's 2-disc release of Innocence, the DTS track has been comfortably fitted onto disc 1, leaving disc 2 free for the extras. One extra you will find on disc 1 is Storyboard Subtitles. When activated, thumbnails of the appropriate storyboard frame will appear at the bottom of the shots they relate to. They're not there for every shot and are very similistic in design, but some will find this of interest. The rest of the extras are on disc 2. A look at the unusual collaboration between the filmmakers and the car manufacturer Nissan, who developed two concept cars used in the film. It sounds a lot more exciting than it actually is – imagine a corporate video that includes interviews with the design team and customer and plenty of shots of the product you're probably close to the mark. The design process itself is of some interest, however. This is a Japanese featurette with fixed English subtitles. An amiable chat with some of those involved in the English language version. ADR director Kevin Seymour comes across as particularly likeable. OK, I got a little twitchy at the prospect of this one, which details the development of a walking and talking Tachikoma robot as a promotional item for the film under the guidance of Tomotaka Takahashi of Robo Garage. But this is absolutely worth watching for the demonstration of Takahashi's humanoid 'Chroino' robot, whose extraordinarily lifelike movements have dropped the jaws of everyone I've shown the sequence to. As with the previous Japanese featurette, the captions are subtitled as well as the dialogue. A conversation with the founder of Production I.G., the company behind the Stand Alone Complex series and Solid State Society. He's a man of few words, but does provide some brief but useful background to the series and the film. It's interesting to hear that the future of the series depends largely on how the American rather than Japanese audience react to Solid State Society. An unsubtle sell to a ready-made audience. A slightly better, more detailed sell, free of English subtitles. Oh...my...God. A nightmarish, Sesame Street-style take on The Ugly Duckling featuring baby Tachikomas that had me sinking into my chair with wide-eyed horror. It even has a song! By the end I was ready to kill everyone within stabbing range. The same horrible thing, only in Japanese. An extended featurette made to build up anticipation for the Japanese release of Solid State Society. Actually a rather good introduction to the Ghost in the Shell Universe, the main characters and the film itself, it includes interviews with several of the production staff but enough extracts and plot info to act as a serious spoiler if you're planning to watch this just before the movie. It's an easy choice. If you're a fan of Stand Alone Complex then Solid State Society comes recommended, but if you're not then you'll find nothing here to persuade you to change your viewpoint. Manga's DVD release is a good one, for the picture and sound and some of the extras, not to mention the nice metal DVD case that may only be available on the initial release, so grab it while you can. Me, I'm forlornly waiting for Oshii's apparently brain-scrambling Amazing Lives of the Fast Food Grifters (Tachiguichi retsuden) to make it to UK shores.